Bangkok bike and long tail boat combo tour, ‘Go Blue’, takes you on a historic journey back to the heyday of the Venice of the East. 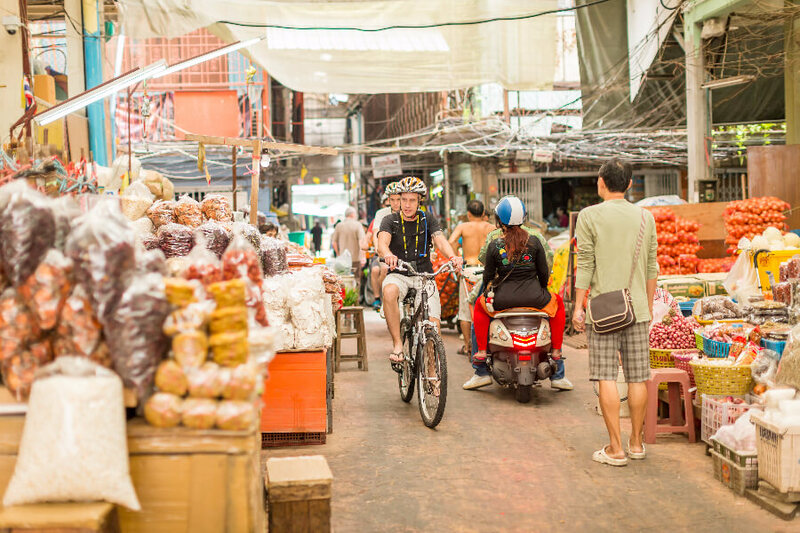 The tour starts with a weaving bicycle ride through the culturally rich and diverse Bangrak neighbourhood. Our first stop is Old Customs House where, hundreds of years ago, merchants would pay taxes on the goods they brought in from all over the world. Next, we ride to and through a historic Muslim neighbourhood and bustling Chinatown. Board a ferry that takes you across the mighty Chao Phraya river into the Thonburi area. After having explored several temple grounds of the old Siam we embark on a long tail boat, together with our bikes, to enjoy a 7 km long tail boat ride. After about 3.5 hours, the hunger is building up so it’s time for a delicious authentic Thai lunch and a refreshing cold drink at the all but famous Thai Artist House. The long tail boat shall take us across the river again where we bike back to the starting point.